20 cm of barbed wire and two light bunkers. The background is a failed soviet exploitation. The British are preparing a counterattack but to stem the flow of supplies to the soviet forces it is decided to launch an airborne attack and seize a train junction. The attacking force is a battalion of paratroopers, landing by parachute, and two supporting companies of heliborne infantry which will fly in with helicopters. NOTE We follow the guidelines for army composition and scenarios LOOSELY. Like in the movies “Pirates of the Caribbean” and the pirate rules, they are more like… guidelines. 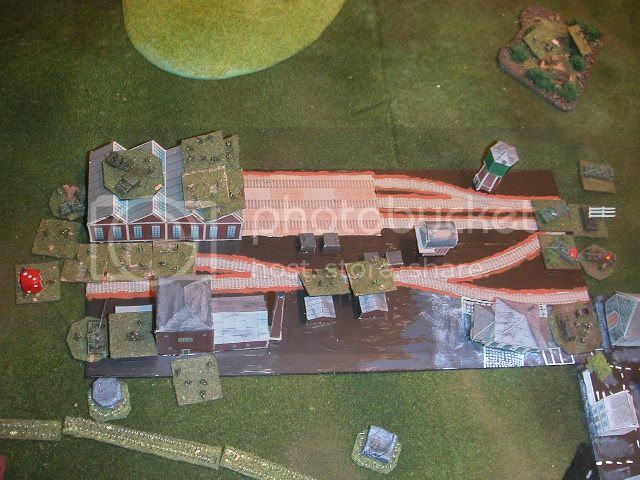 The objective for the British was to occupy the train yard. For the Soviets it was simply to to stop them. The area to the left where the paras will land. Helicopters carrying two infantry companies moving in. The Soviet BTR company in its starting position, prepared to counterattack. The paras performed well and started to move towards the train yard and shooting at targets of opportunity. A soviet inf coy defending from some brush was wiped out. The soviets got their T55 company moving towards the train yard and a BTR company with inf moved around the yard to counterattack. Paras moving in towards the objective. Fortunately the British FAC was good and harrier strikes destroyed the BTR company. The T55 moved into the train yard and started to fire on paras which had taken control over parts of the objective. British paras have gained a hold in parts of the objective. More units moving up. But they are suppressed for the moment indicated by red dice. British artillery decided to get in the game, and blundered immediately, got caught in counter battery fire and that was that. In the objective it was a serious fight with the paras battling tanks and AA guns firing over open sights. In the end the paras prevailed even if they fumbled once and destroyed their own HQ! The soviets blundered once also and lost their shilka. Three quarters of the objective taken. Some T55s still fighting but at a disadvantage against elite infantry in built up areas. They decide to withdraw soon. More British paras and inf moved into the train yard and the soviets, having lost most of their infantry and AA decided to withdraw. Losses were quite light for the British, about 3 platoons were lost. The Soviets lost a bit more all the AA except the SA6 launcher and two infantry companies and the BTRs. So a solid British win. The war is so far going quite well for the British. Next will be a glorious British counterattack! Japp, jag följer händelseutvecklingen med spänning!